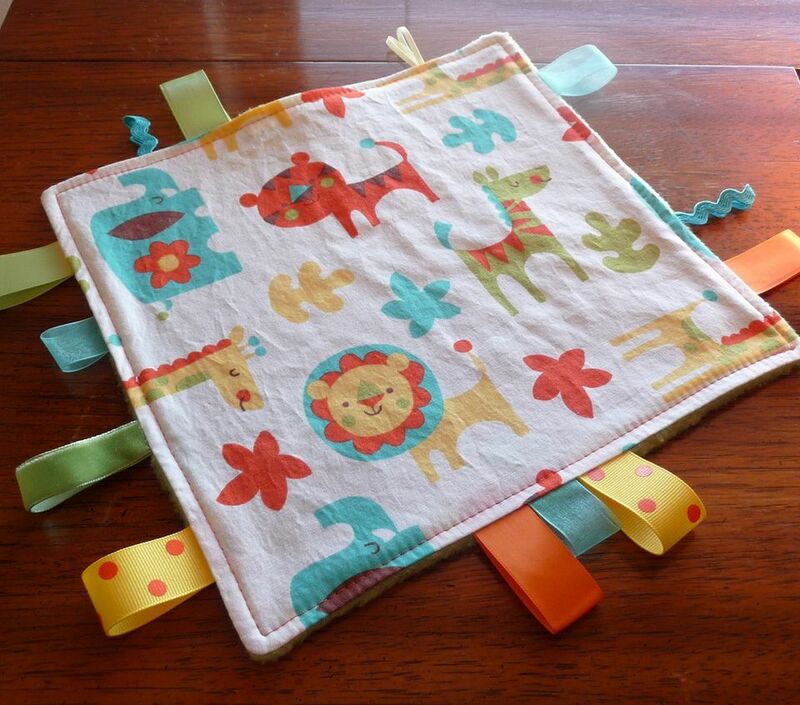 A tag or ribbon blanket is a small baby blanket that is bordered with loops of ribbon that are easy for a baby to hold. Anyone who has watched a child drag their favorite toy or doll around by the tag knows the way a child grabs onto something that is the perfect size for their hand. My first experience with this project was when it was suggested for a premature child as part of a touching therapy. Use your machine embroidery or applique to further the touching sensations on any tag blanket you make. As you'll see there are many free patterns provided in this list. I strongly suggest you browse through them all before making your decision. The different fabrics and methods will make you acutely aware of all the wonderful possibilities. This is a simple project that you can easily combine more than one set of directions to make your tag blanket the best ever! This tutorial is loaded with images so even a beginner can follow the step by step directions. The only change I might make is to use more colors of ribbon. Babies love bright colors. This tag blanket is a little more complicated but the free directions offer you a way to use different fabrics which naturally gives you the option of more colors and textile sensation. These are simple to follow concise directions with photos to show you every step of the process. This is not a free pattern but the pattern is offered at a very reasonable price for the detail that is provided. The finished Taggie Owl is a total visual and textile sensation. These free instructions show you full photo details. Don't let the size of the photos share you away. All you need to do is click the image to see a full-size photo to match the full-text tutorial. Be sure to stop over at this full free tutorial! It uses more ribbons and it has all the details for making a patchwork side to this tag blanket. Loads of colors and options are offered in these free instructions. These free, tidy tag blanket instructions are an easy to follow tutorial. Take a look at these instructions and use them alone or combine them with other instructions to make the best tag blanket possible. These directions are another simple to sew version of how to make a tag blanket. I love the fabric choices and the simple way the directions are presented. I love the fabric choices in this tutorial but I really appreciate the variety of ribbons with different edges , widths and textures. It adds so much to the reasoning behind the entire project. I hope you haven't stopped browsing yet! Take a look at these step by step instructions for another way to increase the touching and visuals in your tag blanket! The free directions will guide you through every step of the process to make a unique taggie blanket. These are not detailed, photo intense directions but you owe it to yourself to have a look at how rick rack was used as a ribbon. It is a great visual and textile sensation.